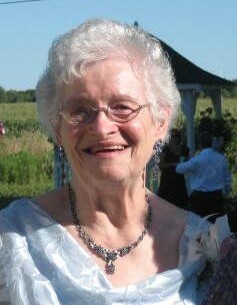 Passed away peacefully at Frost Manor, Lindsay on November 11, 2018 in her 98th year. Daughter of the late Groff and Kathleen Jones of Madoc. Predeceased by her loving husband of 42 years, Frank Szilagi. Beloved mother of Sandy Clayton (Dave), Sharon Laing (Bruce) of Alberta. Cherished grandmother of Kari Kernaghan (Mark), Hollie Graham (Pete), Hope Read (Rainey), Stacey Plitt. Loving great grandma of Brendan, Raya, Colin, Kiera Kernaghan, Natalie, Krista, Rachel Read, Anika, Brooklyn and Ainsley Plitt. Predeceased by her brother Gordon and his wife Kathleen Jones of Whitehorse and fondly remembered by his daughters. Following cremation, family and friends may gather for a memorial reception on Saturday, November 24, 2018 from 2:00 pm to 4:00 pm at the Lakeland Funeral and Cremation Centre, 19 Moose Road, Lindsay. If desired donations may be made to the charity of your choice.